The overall crime rate in the 30 largest cities in 2017 is estimated to decline slightly from the previous year, falling by 2.7 percent. If this trend holds, crime rates will remain near historic lows. The violent crime rate will also decrease slightly, by 1.1 percent, essentially remaining stable. Violent crime remains near the bottom of the nation’s 30-year downward trend. The 2017 murder rate in the 30 largest cities is estimated to decline by 5.6 percent. Large decreases this year in Chicago and Detroit, as well as small decreases in other cities, contributed to this decline. The murder rate in Chicago — which increased significantly in 2015 and 2016 — is projected to decline by 11.9 percent in 2017. It remains 62.4 percent above 2014 levels. The murder rate in Detroit is estimated to fall by 9.8 percent. New York City’s murder rate will also decline again, to 3.3 killings per 100,000 people. Some cities are projected to see their murder rates rise, including Charlotte (54.6 percent) and Baltimore (11.3 percent). These increases suggest a need to better understand how and why murder is increasing in some cities. 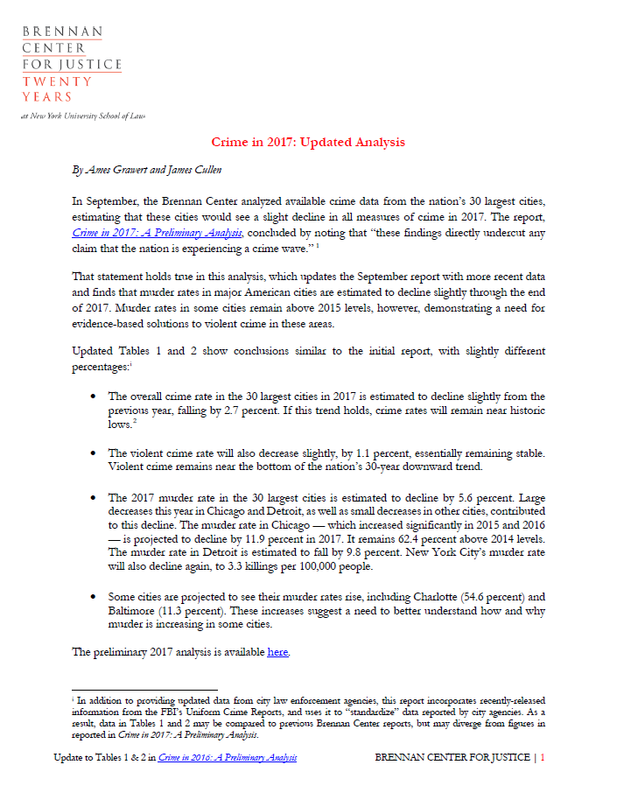 The preliminary 2017 analysis is available here.